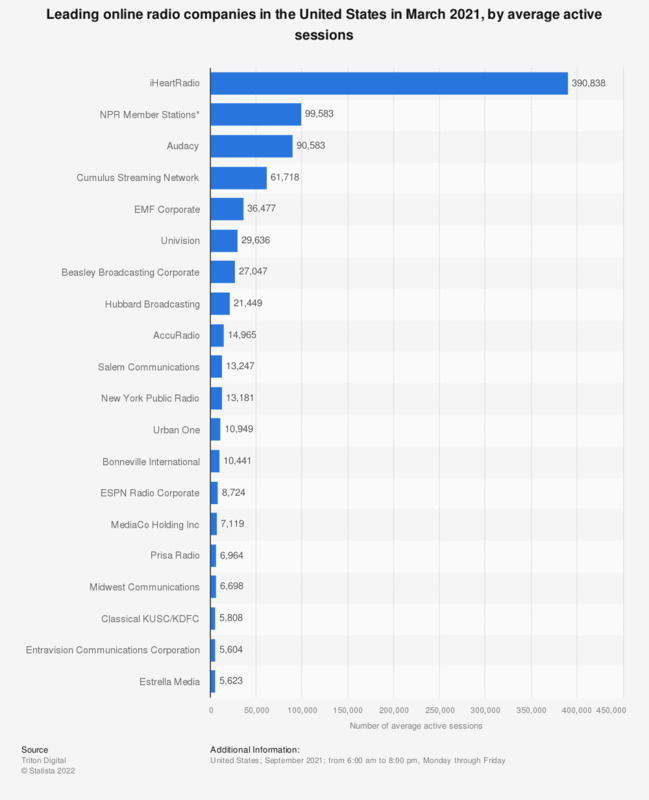 The statistic presents data on leading online radio companies in the United States in December 2018, ranked by the average number of active sessions. Spotify ranked first, with around 2.83 million average active sessions in December 2018. In second place was Pandora, which had 2.37 million average active sessions. Online radio companies have increased in popularity over the past several years, corresponding with the increase in radio streaming devices, such as smartphones. As of early 2014, the global radio market was strong, especially in the United States. Revenue earned in the U.S. in 2013 from the radio market amounted to roughly 20 billion U.S. dollars, a value significantly higher than any other market in the world. In fact, U.S. radio industry revenues made up slightly less than half of the total revenue earned worldwide from the radio industry. In 2018, global radio revenue totaled 50.7 billion U.S. dollars and a steady yearly growth has been forecasted until 2018. The increased revenues could be attributed to the ways in which consumers have listened to the radio and utilized the range of platforms available to them. Radio stations can now be accessed through smartphone apps, on PCs, laptops and tablets, in the car and not forgetting, of course, the traditional radio set at home. The longevity of radio has been undeniable as it has remained a fundamental part of people’s lives in modern society. In 2018, radio reached 92.8 percent of all women and 93 percent of all men between the ages of 35 and 64 in the United States. *The source notes that NPR Member Stations experienced minor and varied data issues throughout the period.